Officer David Pilkington of the Chandler, Arizona Police Dept. went that extra step and found a car and suspect wanted in connection with a homicide. 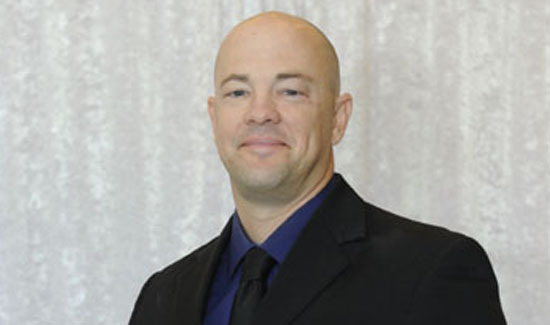 Officer David Pilkington of the Chandler, Arizona, Police Department, has always had a habit of going above and beyond. 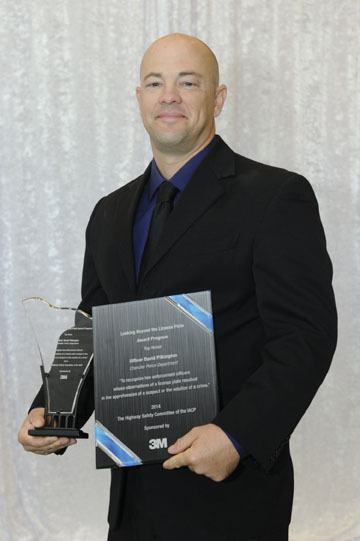 It was his strong work ethic and desire to always do the job a little better than he did the day before that landed him top honors at an annual awards ceremony hosted by the 3M Corporation. The Looking Beyond the License Plate award is an IACP Highway Safety program sponsored by 3M’s Traffic Safety and Security Division that recognizes officers who used a license plate reader to help solve serious, non-traffic related crimes. Officer Pilkington used the technology to help identify a stolen vehicle. Parking lot video surveillance enabled the officer to identify the suspect who stole the vehicle and a further investigation revealed that both the suspect and the vehicle may have been involved in a homicide. * Trooper Brian Bass, Georgia State Patrol, who identified a vehicle matching a description issued in an Amber Alert. Two men were taken into custody and the kidnapped mother and child were also located and found to be unharmed. * Trooper Jeffrey Crofoot, Michigan State Police who identified a stolen vehicle involved in the shooting death of Michigan State Police Trooper Paul Butterfield. One of the suspects linked to the vehicle was tried and convicted for the murder. * Officer Daniel Sekely, Prince William County Police Department, located a vehicle displaying altered tags. Receiving permission to search the vehicle, Sekely identified several items that were listed in a recent crime bulletin. The driver, along with seven other suspects, were linked to nearly 70 burglaries in the area. * Patrol Officer Nicholas Kundert, of the Colorado Springs Police Department, used a license plate number to help identify a stolen vehicle at a motel parking lot. While Kundert was inspecting the vehicle, the suspect locked the vehicle with the key from his motel room. With a search warrant, officers searched the suspect’s room where they recovered the keys to the stolen vehicle as well as numerous items and financial information from more than 40 victims. Follow-up investigations led to the conviction of the suspect for theft, identity theft, possession of identity theft tools, forgery, and possession of identity documents. Past recipients of the award have captured most wanted fugitives in Canada and Virginia, thwarted homicides, aided in the arrest of a perpetrator wanted in connection with multiple, vicious abductions in northern Virginia; and aided in the apprehension of Timothy J. McVeigh just 75 minutes after the 1995 bombing of the Murrah Federal Building in Oklahoma City, Oklahoma. Visit 3M.com for more information.